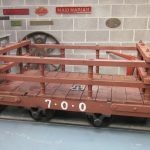 2 Ton Slate Waggon 1ft 10 ¾ gauge known as Waggon Llwythwr. These are of a conventional timber design but have small 1 ft diameter double flanged wheels loose on short axles which do not cross the waggon. This allows the waggon to be shunted onto the larger 4ft gauge transporter waggons of the Padarn Railway which had large wheels protruding above the deck. These waggons were not numbered but it is thought that there were as many as 2000 built. These waggons were to the same design as the slate waggon but had a different body/basket. These had sheeted iron sides held in place by special bobbins. These sheets held coal inside the waggon. 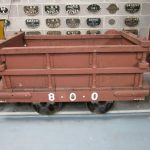 The waggons were used to carry finished slate down to the port, and carried coal back to the quarry for use in locomotives and stationary boilers. Despite its appearance this is not a brake van, nor a garden shed. This is a van for the brakeman to ride in. 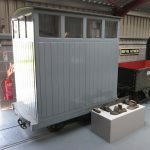 The van was semi permanently fixed to the 4ft gauge Padarn transporter waggons, the brakeman had to climb out of the van to apply the brakes on the Host waggon, Four of these timber versions were built. Three Yellow trucks were built by the Dinorwic Slate Quarry to transport Important Visitors and Royalty around the quarry. All three vehicles were very different in appearance to one another. The example here was the largest, had springs for a comfortable ride and carried the most important visitors. It is timber built but includes a steel frame for extra strength. The last time the coach was used by the quarry was on 6th May 1967 for the Maid Marian Locomotive Fund Handover. 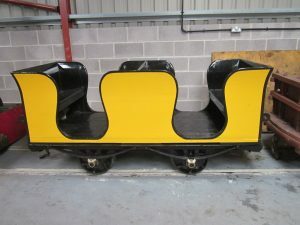 It is now owned by Penrhyn Castle Railway Museum but is now on permanent loan for display and use here at the BLR.